Is President Obama a good leader? Image caption Has Obama, the master storyteller, lost control of the narrative in office? When President Obama was elected he seemed like a different kind of leader. Not just the first black man in the White House but a new sort of American president: thoughtful, reflective and determined to represent all of his country. Now, a year away from the next presidential election many people question what sort of leader he has turned out to be. One unkind critic said that he seemed like a 50-year-old man who has just got his first proper job, that he has had no experience of running any organisation and it shows in his management of the White House. Republicans are of course the harshest critics. Ed Rogers, a veteran of the George H W Bush and Reagan White House, told me: "I think Obama is not a very effective leader. "I think he is a thinker and a ditherer to a fault. I think his leadership style does not lend itself to crisp decision making. "I get the impression he anguishes before a decision, and even worse for a president, he anguishes after a decision. So, his team never has certainty. "They never know if the other side is back in appealing to the president, they never know if they have gotten clear, certain decisions. "And at the end of the day being president is about making decisions and sticking with them." Of course in part Mr Obama's initial appeal was that he did consider the facts, carefully and dispassionately. He was seen as the diametric opposite of his predecessor, President George W Bush, in the popular imagination a cowboy president who shot from the hip, trusting his first gut instinct. Mr Obama, on the other hand, likes to get down with the details. When he was economic advisor to the vice-president, Jared Bernstein attended daily economic briefings with Mr Obama throughout the worst of the economic crisis. He still marvels at just how wonky the president can be. "I remember one day Paul Volker, the former chairman of the Federal Reserve [of New York], and we were showing the president data on differences in interest rates between credit instruments at a level of minutiae and I remember Volker coming out of the meeting saying, 'wow I can't believe the president was interested in that'." But Mr Bernstein says that in the middle of a crisis - when the tiny daily changes in the markets could make a critical difference - that was no bad thing. He makes the point that Mr Obama was faced with an immense challenge and says he stopped the economy going off the edge of a cliff. "The guy has an amazing capacity to assimilate a lot of information. He really likes to solve a problem pragmatically - but from a perspective of being as well informed as he can be. "He certainly doesn't reach snap decisions. He is a pretty deliberative guy, but you put the facts in front of him he will reach a conclusion pretty quickly. "I think what looks like excessive deliberation has more to do with the politics. The president might come to a decision on economic policy pretty quickly, but then you've got to navigate this Congress and that is a fairly tough equation, getting through all those road blocks." But the president has to be a navigator, or at least know people who are. Mr Obama does not seem to have a strategy for dealing with the sausage factory that is Congress. It has perhaps been his worst failure. True, he not only got through economic packages which admirers would say saved the country, he also in the end got a healthcare package that has long been a dream of Democrats. But it was so diminished that it offended his own side while enraging the right and helping the Tea Party to get off the ground. The trail of sometimes grubby compromises that led to a deal made him look part of a Washington he said he had come to fix. Perhaps even more importantly it led to an unclear proposal that left many Americans confused and worried that it would leave them worse off. Mr Obama seems to lack the sort of special political skills you need to make sausages (Bismarck said you don't want to know how sausages or laws are made). He's obviously not a thug nor, more oddly, a charmer. Undoubtedly he has buckets of charisma. It is just that he doesn't spend any time tipping it all over senators and representatives. Powerful men and women can be surprisingly easy to persuade if even more powerful people bathe them in love. Strangely, Rahm Emanuel, a charming bully if there ever was one, doesn't seem to have done the trick when he was chief of staff. Of course, since the Republicans gained control of the House of Representatives in last year's elections things have become even more difficult. Critics on the left like Jesse Jackson don't want a bridge-builder-in-chief. "I think sometimes he wants to heal the wound by taking the glass out," he says. "He wants to avoid the confrontation. "Former President Lyndon Johnson knew that you had to defeat southern institutional racism and gender bias - and you had to defeat them politically and then reconcile. "Barack Obama wants to reconcile without engaging in the battles." But this is essential to the president's image. He portrayed himself not just as a bridge builder, but the bridge. (It is also the title of the most serious study of him to date). What made Mr Obama a unique political phenomenon was that he, quite literally, wrote his own story. When most politicians pop up in the public eye national journalists often rely on early profiles in local newspapers and of course their own investigations to paint a picture of the new kid on the block. Mr Obama wrote his own story in Dreams From My Father before he was even on the public stage. Yet this master storyteller appears to have lost control of the narrative in office. Some may think this is post-modern claptrap or simply a silly way to look at politics. But part of being a leader, and especially an American president, is telling people in very clear terms what is going on, why it's going on and what should happen next. 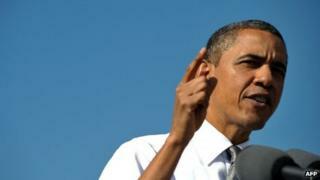 Mr Obama himself has said the best solutions to the economic crisis may not be the best story. The plot twists of real life get in the way of a simple tale. The president - and just about everyone else - thought the economy would be showing stronger signs of recovery by now. But the author of a critical book about the president's handing of the economic crisis, Ron Suskind, says the disconnect is the problem. "Even if the words of a leader are not along the lines of what people want if they match his deeds people say 'Well, I may not agree with him, he's a straight shooter' and that gets you confidence points. "Mr Obama has had trouble because of his brilliance at soaring rhetoric - inspirational rhetoric. "And often the caution that has abided his deeds, a kind of split-the-middle-let's-find-some-middle-ground, even if there is not much coherence to it, a half of this and a little of that, often does not make sound, dramatic policy." Republican strategist Ed Rogers says Mr Obama has lost something that set him apart: his clarity. "I think that if you ask people who love and support Obama what are his three or five priorities they couldn't tell you. That means his message has lost its way. "When you are president, people always need to know what you would do if you were a dictator. What you would do. Not what's possible or the realities of Congress or the limits on your authority. "What would you do if you were dictator? People don't know that about Obama. And that's a problem. A weakness. And stylistically it is going to be hard for him to get that back." But Ron Suskind points out the story is not yet over. "I think he is a leader with extraordinary capacities. He is brilliant. The question that emerges is, 'is his brilliance the kind that makes for great presidents?' The kind that creates a distillate of decisiveness? "That remains to be seen. He only has a few months to do something dramatic in terms of words and deed before he slips into the swirl of an election. This is his moment." Second-term presidents, freed to a certain extent from the cruder political considerations about their own future, can surprise. We may see that happen. But we may not. Mr Obama first has to convince people that he is a leader, even if one with faults. An election is a choice, not the final judgment of history. He has to persuade people not that he is the best leader ever but the best on offer. This is the second in a series for the BBC Radio 4's Today programme. You can hear yesterday's piece by clicking here. Tomorrow: Has President Obama's foreign policy abandoned the idea of America the exceptional? Obama: Can he win the youth vote once more? Fr Martin Magill receives a standing ovation when he asks why it took the journalist's death to unite parties. Beyond Today: Can we save the planet and still keep our stuff? Donald Trump state visit: What can we expect? Is mental health in music still at risk?